No matter how bleak this winter weather may be, there is a light at the end of the tunnel and it’s called spring! Get excited about lighter fabrics and open-toed wedges. It’s fun to think about bright ensembles, but not so much fun to think about changing your whole wardrobe. Have no worries, because with these tips and featured transitional pieces, your closet will be ready for a warm and trendy spring! Let’s start with leather leggings and pants. They were a go-to when it came to looking chic in cold weather. Now that spring is (somewhere) in the near future switch out your leather leggings with jeans. A lighter wash is always a good choice while spring months are approaching. 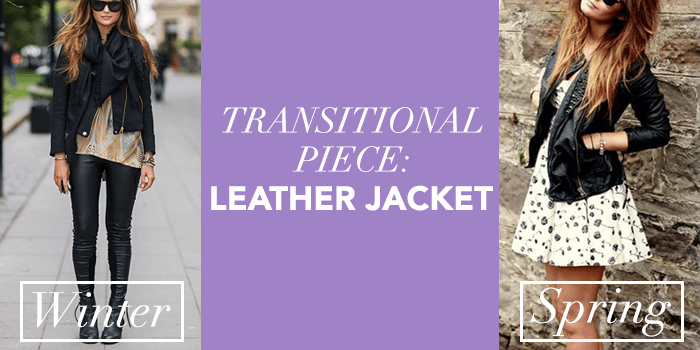 When it comes to leather jackets, feel free to hang on to those through the coming months. Pairing an edgy leather moto jacket with a spring dress in floral creates a perfect contrast. This is the perfect pairing for those not really cold, but not yet hot days leading up to spring. Don’t pack away everything winter, but you should start keeping less of them in the front of your closet. This can be applied to anything from accessories to tops. Trade out your snow boots for light-colored leather boots. They are still warm, but don’t look strange when paired with spring clothing like floral dresses. You can still hang on to your scarves (because scarves are great for any season), but wear the scarves made of lighter fabrics instead of heavy knits. Thick knits can be traded for a basic top and a cardigan. This way you’ll be able to take off a layer if the day begins to warm up. Switch out black pants with lighter neutrals like tan and white. 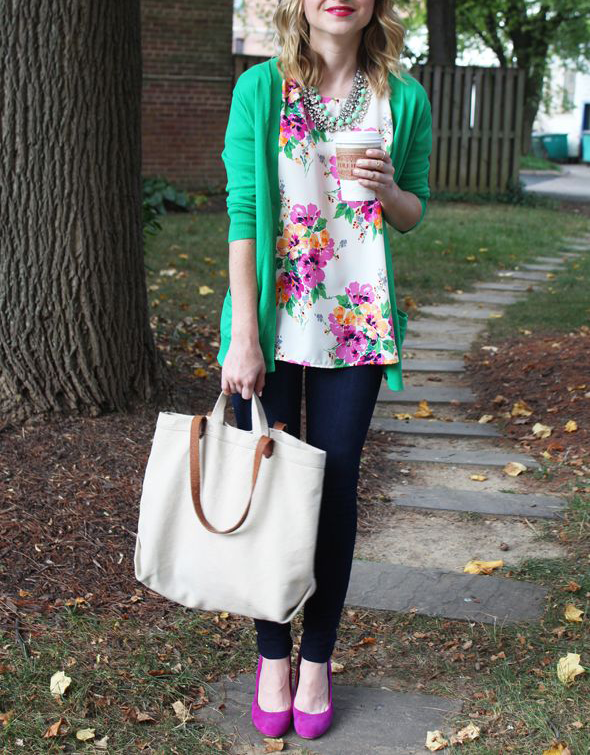 Start incorporating more color into your ensemble. The usual winter wardrobe consists of dark, dull and muted colors. Burst out and make your spring debut by adding colorful pieces and fun prints. 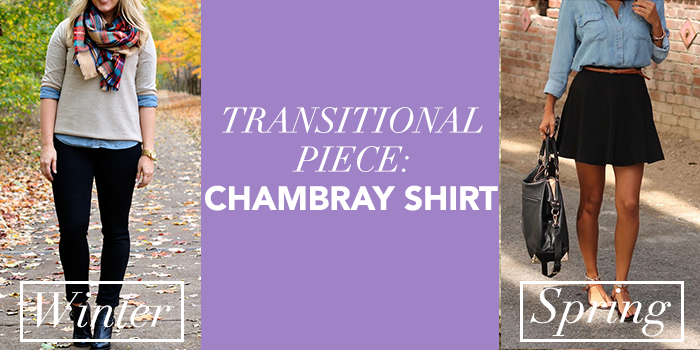 We know we said we’d help you transition your wardrobe, but there are things outside of the closet you can change in preparation for spring. Brighten up your makeup palette, try a cute new haircut or switch out your nail polish for something more lively. Don’t feel like clothing and accessories are the only things you can alter in order to transition to a warmer season. Finding transitional pieces and repurposing clothing you already own is great, but sometimes you just want to splurge. If you are looking forward to shopping for spring clothing, but want to do so wisely, search for timeless pieces. There will always be new trends, styles and silhouettes at the beginning of any season. To make sure you’re buying clothing that will still look great on you next year or even next season, build a wardrobe with timeless pieces in versatile colors or prints, classic cuts and good quality material. When you want to try a new trend, you’ll only have to add a few accessories or a statement piece in that style. Combine the trendy pieces with your timeless articles of clothing for a style that looks effortless. These are generally good guidelines and tips to follow when thinking of how to transition from winter to spring. Remember, there are always exceptions to any rule, so don’t feel permanently tied to anything. It’s always nice to have a good go-to idea when you don’t want to over-think your outfit.